FAQ: Where Did You Get That? 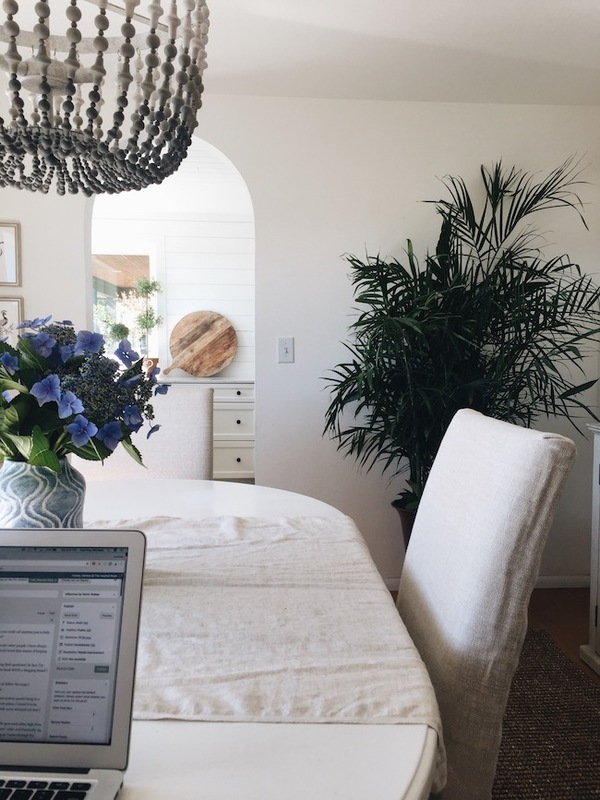 Today I wanted to fit in a quick update to answer some of the most FAQ on items I have in my house. I can’t get to all of them in one post, but I’ll at least answer some of them :). 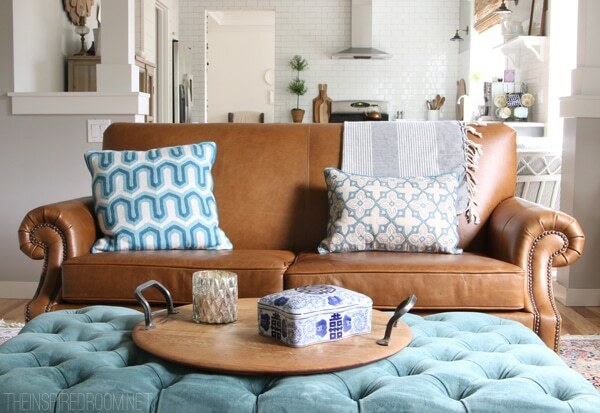 One of my most frequently asked about pieces of furniture is our leather sofa. We bought this sofa about two and a half years ago, when we lived in our old house. We chose leather (ours is the Brooklyn Leather) because I not only love the sofa’s toffee/caramel color, but my white slipcovered sofa was starting to drive me crazy. Once we had two pups running straight to the sofa from outside all day long, the upkeep and care of a white slipcover was just more than I wanted to deal with. 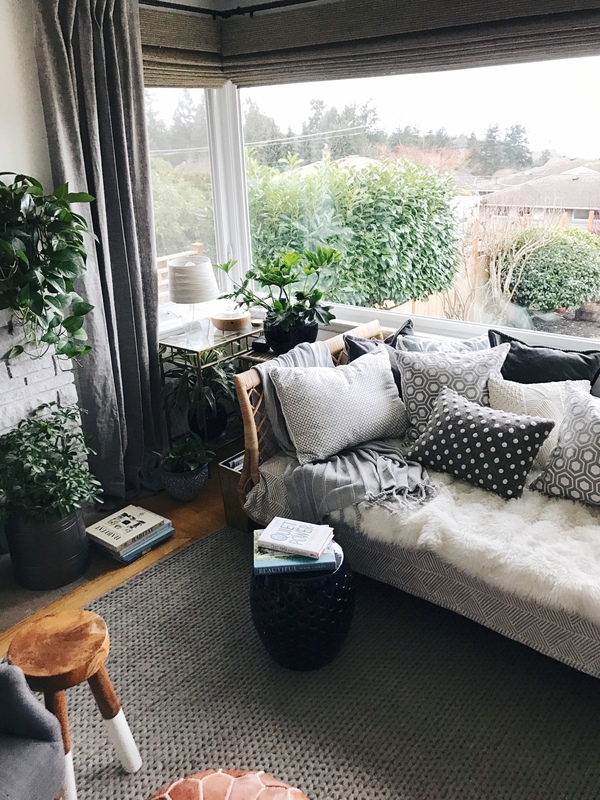 I’m still a fan of slipcovers because they really are relatively easy to keep clean (you can read my post about the slipcovered sofa saga here), but at that time I was just over it. We needed a new sofa anyway so it was a good excuse to try leather! I have no regrets in purchasing the leather sofa. I absolutely love it. It’s 100% carefree. Yes, Jack sometimes loses his mind and tries to dig his way through the sofa. Why? I don’t know. But guess what? As hard as he’s tried, he’s never punctured the leather. Even though he is able to scratch the surface, I am in love with how the sofa has aged. It’s beautiful. It is softer, more comfortable and has more character as time goes on. 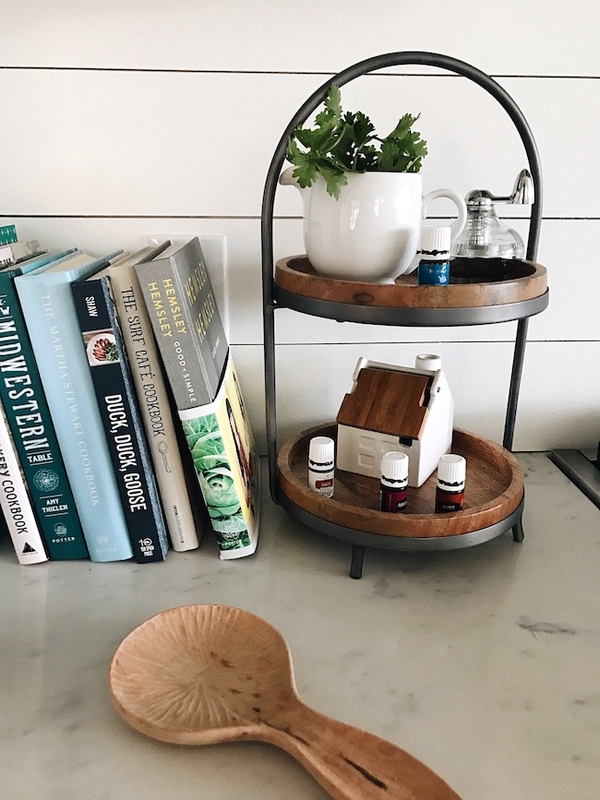 This little stand generates a lot of questions whenever I post it on social media or the blog. I’ve had it for quite awhile, but it’s still one of my favorite things! 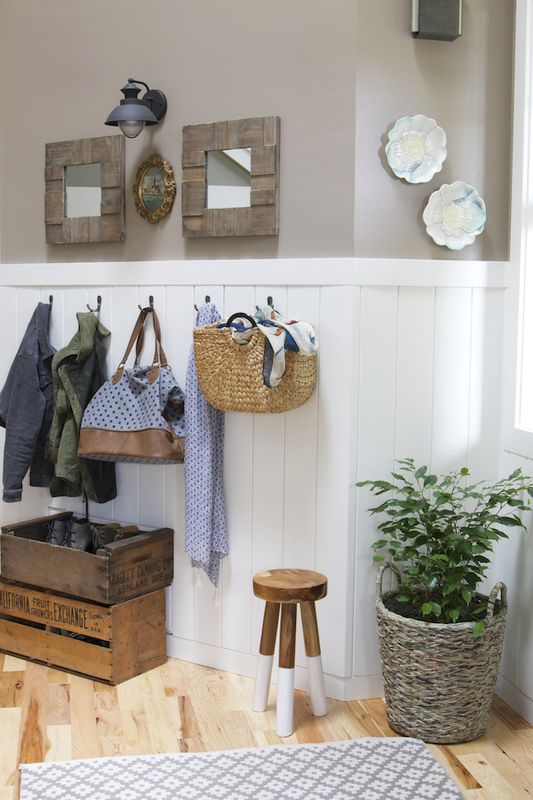 It’s super sturdy and versatile, so it comes in handy all the time around our kitchen and dining room. 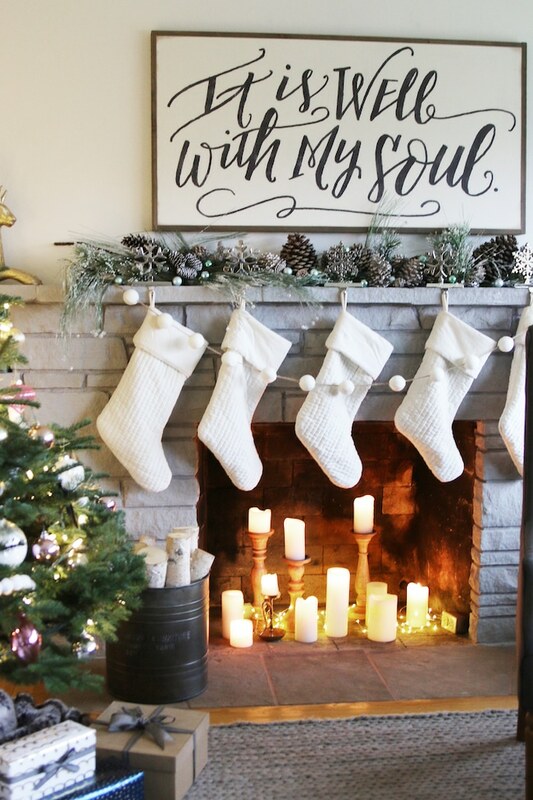 It would be cute in any room of the house, don’t you think? (PS. for those who have asked, the little house on the stand can be found here!). 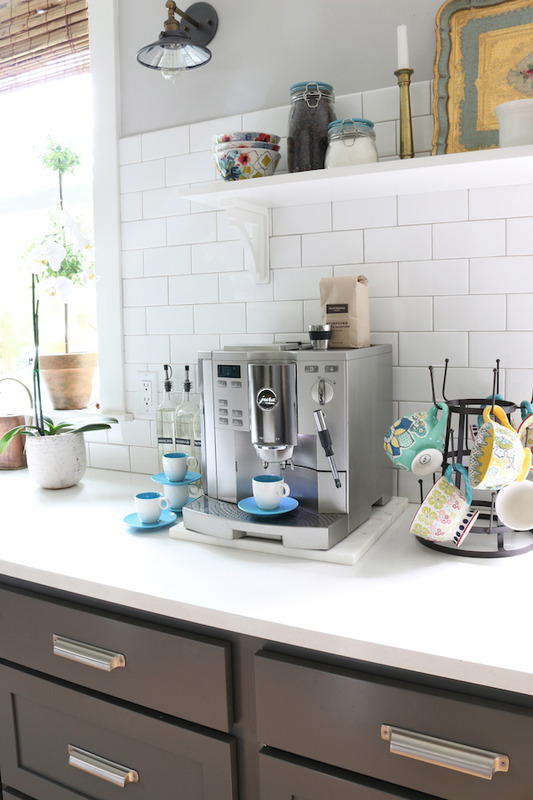 The mug rack I got years ago turned out to be one of the most asked about items I’ve ever posted. Also, this is my beloved brand of espresso machine. It was pretty spendy (it was actually my parents, I didn’t buy it myself) but it made such good coffee and lasted forever (like ten years?). 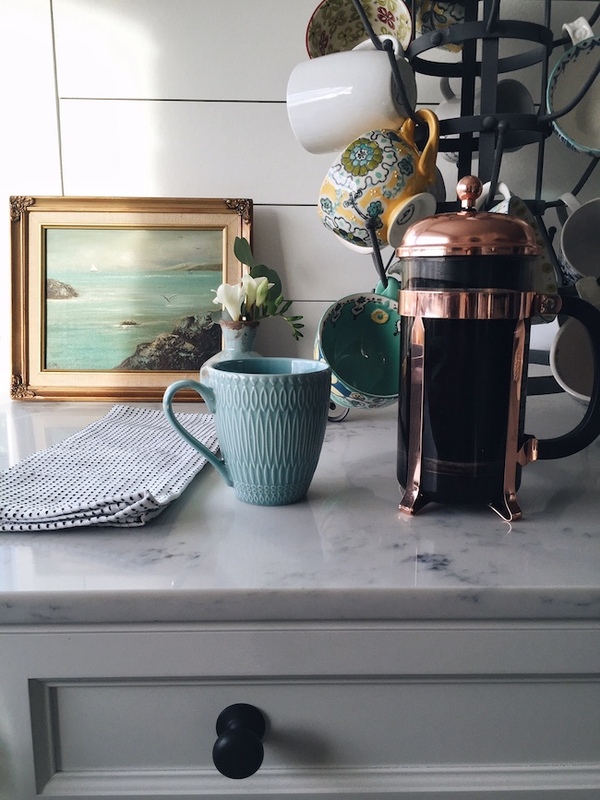 I no longer have an espresso machine (sadness, at least for now) but I’m super happy with my copper French press. It’s another of my frequently asked about items! And if you’re wondering about one of my mugs, most are collected locally or from Anthropologie. 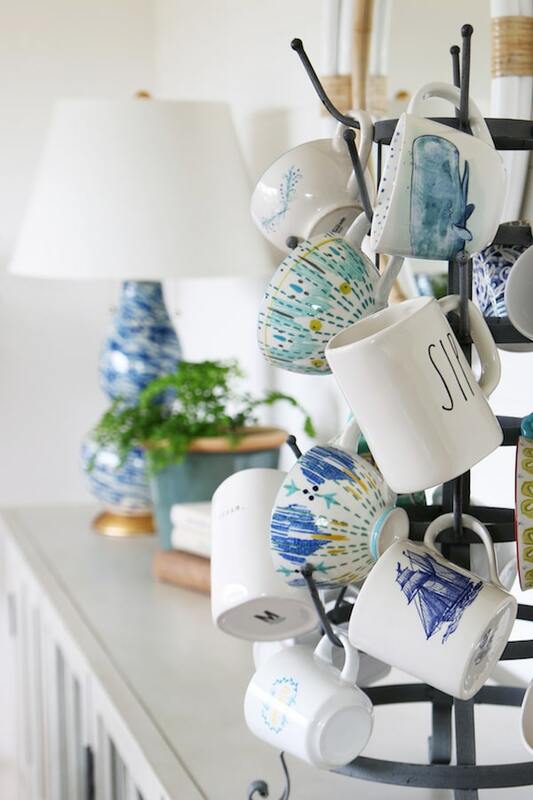 We also love our Rae Dunn Mugs (like the “Sip” mug in the above picture). 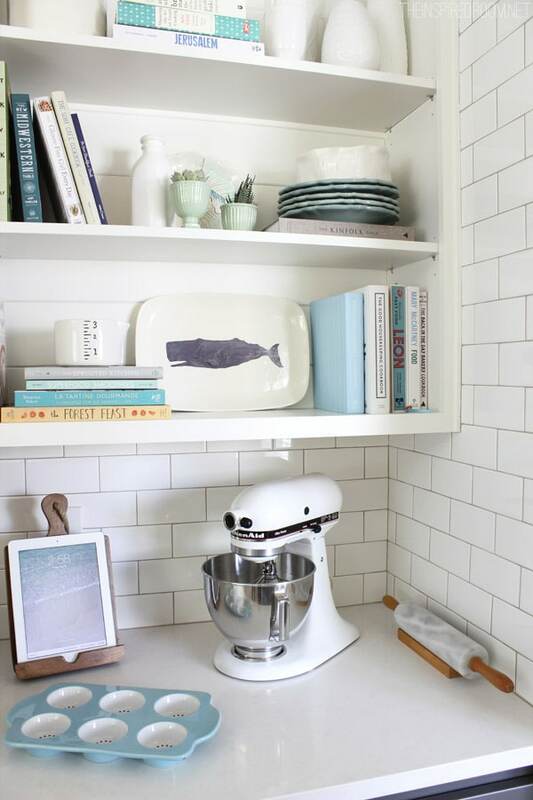 You can get the big 24-hook mug rack here. I love to decorate with art that is meaningful to our family. I got this It Is Well sign before Christmas last year. It’s quickly become one of my most frequently asked about items. You can find other meaningful art here. This cabinet is still one of my most favorite purchases ever. I got it on sale at Restoration Hardware (in the antiqued taupe color), it was actually one of their more affordable cabinets at the time. It’s really great quality and has held up perfectly for years. 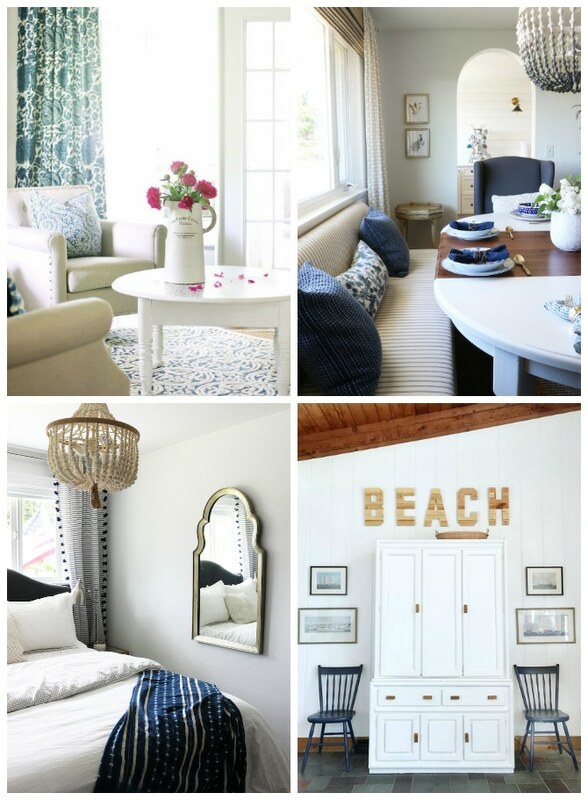 I got the blue & white lamps years ago, too. I have two sets (two different colors, navy and light blue). They survived our move and boys and dogs, so I still give them a thumbs up! 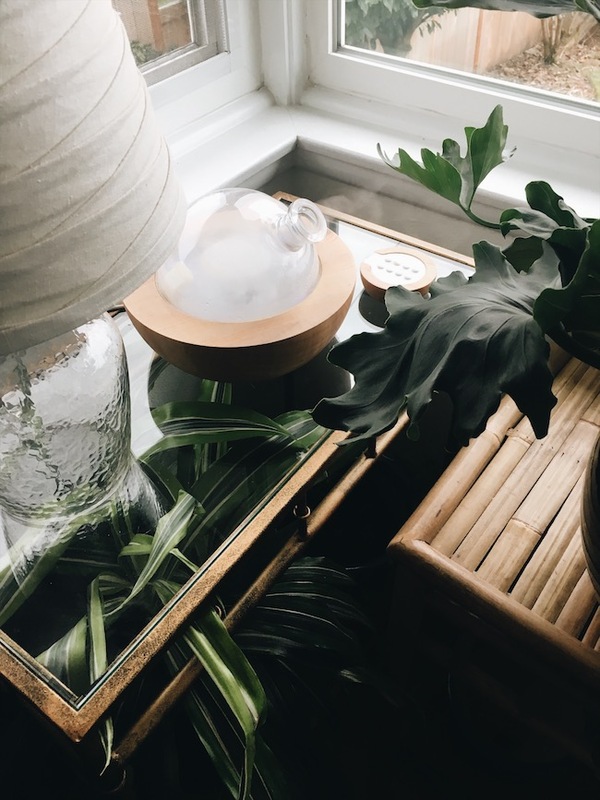 This essential oil glass diffuser (the Aria) always generates ooh’s and ahh’s and rightfully so. It’s not only a gorgeous piece, but it plays music, too. I keep it my living room and use it all the time. I’ve had mine for a couple of years now and it’s still going strong! I definitely recommend it. 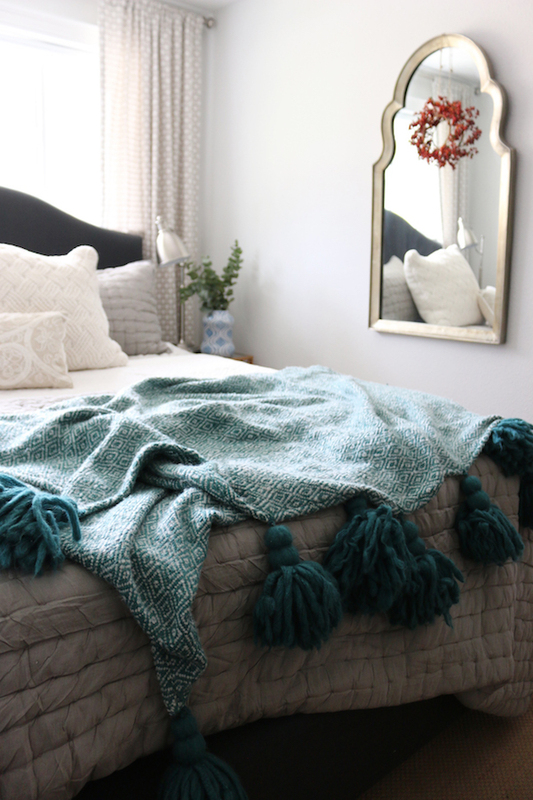 Who knew giant tassel blankets would become such a thing? I’m glad I bought one a few years ago. It is the perfect statement throw for a bed and I’ve used it a lot. Mine is actually sold out, but you can find similar ones here and more in this round-up post. 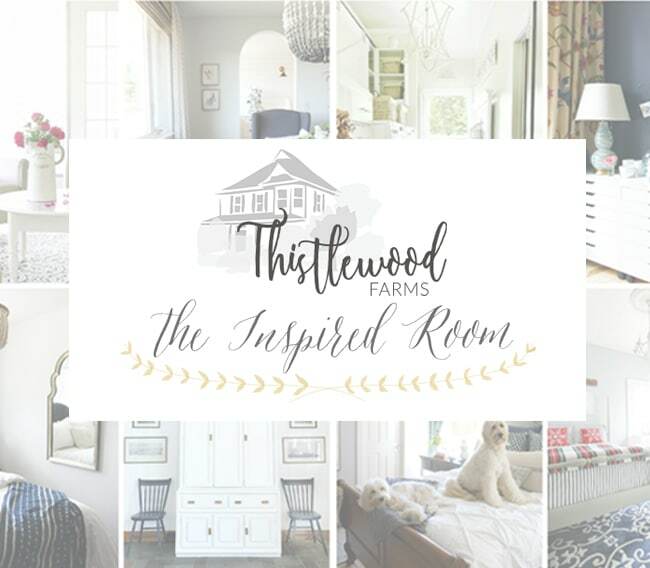 More details on the above room can be found here. I got two of these now popular dip-dyed stools a few years back and I am still so happy with them! 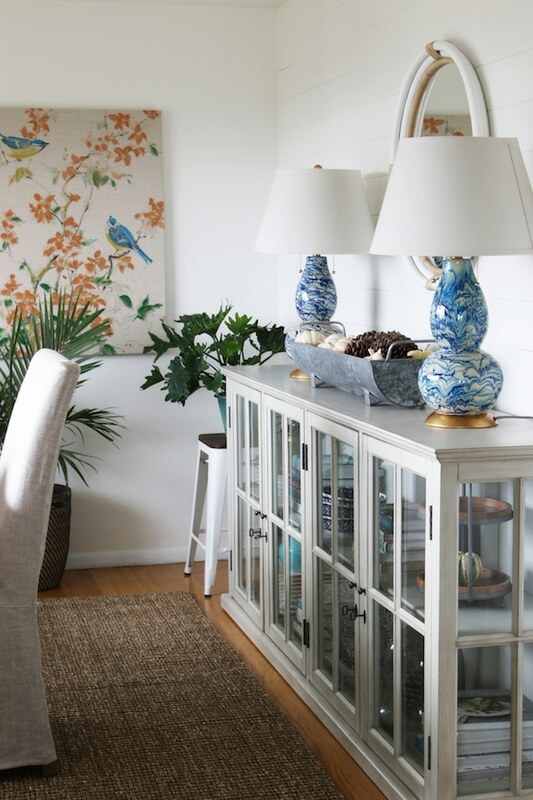 We use them mostly next to a chair or sofa for an end table or even just as an accent piece. They do come in handy. Before Christmas, I decided I wanted a bigger rug for our living room. I found this cable knit wool rug on sale and it’s exceeded my expectations. I was a bit worried that it wouldn’t be as practical for our pups, but it’s been totally great. It shed a bit at first, but it seems to have finally stopped. It’s a super soft, plush neutral gray almost braided style rug. I’ve seen similar ones at Restoration Hardware for tons more, so I feel like this one was a good deal for the quality! It definitely made our room feel more cozy and inviting. 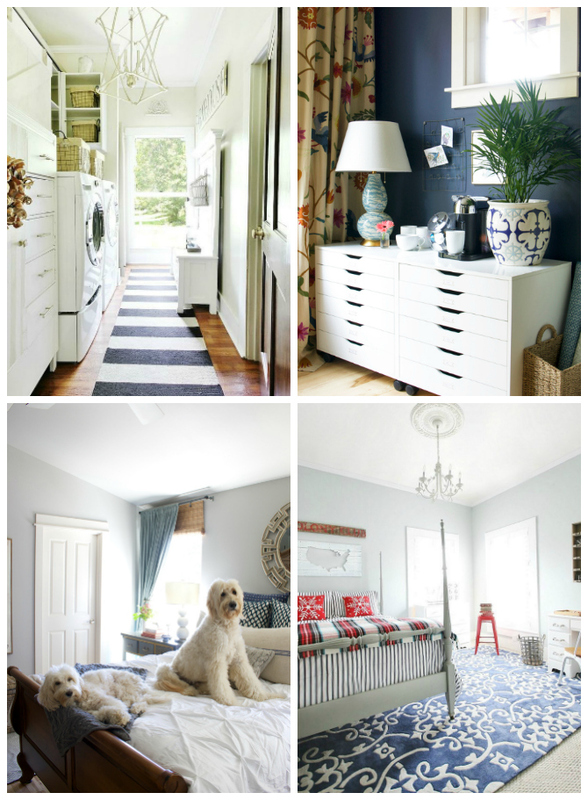 I still love my blue and white rug and continue to get lots of questions about it. It is really a great statement rug, very durable (an indoor/outdoor rug is perfect for families and dogs) and such a deal, too. 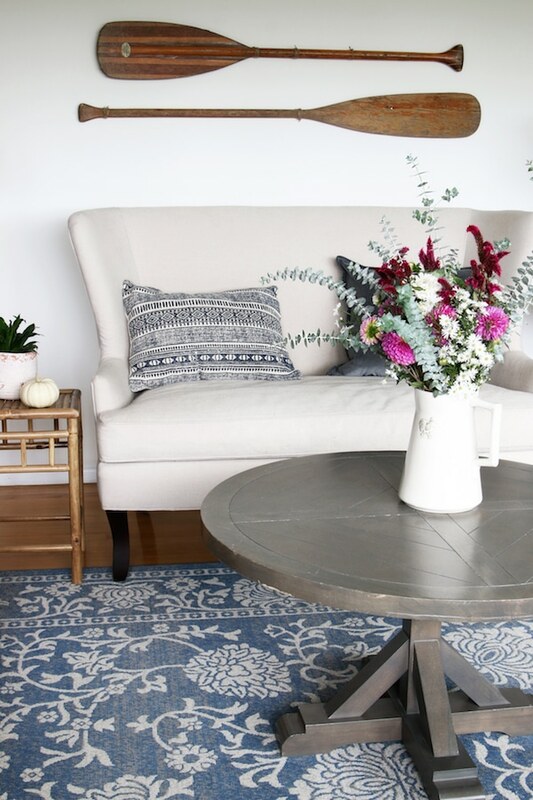 See our post with a round-up of more patterned statement rugs here.